Hi, I went into the Shoe Zone store in Bury St Edmunds on 05/07/15 and purchased 2 pairs of sandals exactly the same 1 in black and 1 in white. I wore the white ones once and noticed that every time I walked the left sandal made a noise. On 11/07/15 I took both sandals back and was told by the assistant that I couldn't return them as they had been worn even though I had my receipt. She then told me "I'll call my manager if you like but she will tell you the same thing". The manner in which she said this wasn't nice. I then said "So I'm now stuck with a pair of shoes I cannot use" to which the reply was "Yes". I returned the black ones as they hadn't been worn but I am now stuck with a pair of sandals which I cannot use and out of pocket. I will never purchase anything from Shoe Zone again as the customer service was awful and that you can never take anything back that is faulty. I will be ringing Head office to make my complaint. 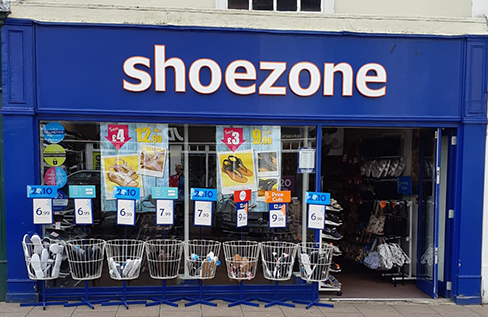 Hi, I went into the Shoe Zone store in Bury St Edmunds on 05/07/15 and purchased 2 pairs of sandals exactly the same 1 in black and 1 in white. I wore the white ones once and noticed that every time I walked the left sandal made a noise. On 11/07/15 I took both sandals back and was told by the assistant that I couldn't return them as they had been worn even though I had my receipt. She then told me "I'll call my manager if you like but she will tell you the same thing". The manner in which she said this wasn't nice. I then said "So I'm now stuck with a pair of shoes I cannot use" to which the reply was "Yes". I returned the black ones as they hadn't been worn but I am now stuck with a pair of sandals which I cannot use and out of pocket by £12.99. I will never purchase anything from Shoe Zone again as the customer service was awful and that you can never take anything back that is faulty. I will be ringing Head office to make my complaint. Store is well presented and well stocked.